The Three of Disks. Constructivity. Building. Designing. Planning. Accomplishment. Competence. Teamwork. Cooperation. The Three of Disks corresponds to the Sefirot of Binah; understanding, the birthing ground, and the plane. The Three of Disks is where the energy of the Suit begins to come into itself and realize some of its potential; it is where the groundwork for the subsequent numbered cards in the suit, and provides a base for them to build off of. 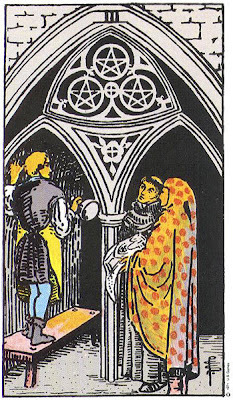 In the case of Disks, this card is Works; it represents great accomplishments finished through Teamwork and Cooperation, as well as Competent Planning and Design, resulting in something being Built. 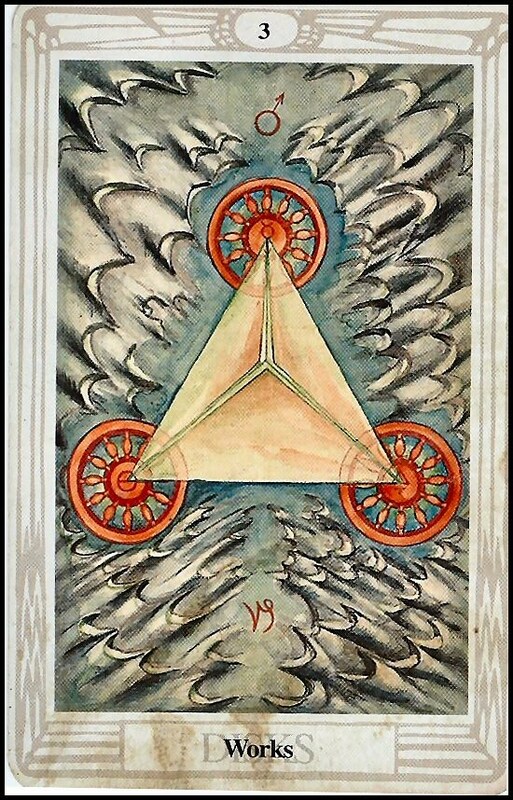 This card represents the practical wisdom of working together with others, reflecting the duality seen in the Sefirot of Binah, and the subsequent material benefits of this action. The Rider-Waite art shows three men in discussion, one of whom is holding what appears to be some sort of blueprint or plan. They stand beneath ornate architecture, emphasizing this card’s emphasis on Teamwork and Building. The Thoth art shows an aerial view of a pyramid amidst the desert sands; one of the greatest collaborative works ever achieved. In a reading, this card asks you to examine the role that working with others to achieve a common goal has played in your life. Are you part of a team? Have you been working together well? Have you planned things out to accomplish your task? Reversed, this card’s energies are twisted or blocked somehow; perhaps your team is not as competent as you would have liked, or you need to rethink your plan.